Kat is not an average 15-year-old girl. She has transferred schools, changed her name, and is in the process of secretly transitioning from male to female. She is one of four teenagers balancing at the edge of who they are and who they must become. What was the inspiration for At The Edge? Alexandra H. Rubin: I started writing "At the Edge" under the title "Yet to be Titled" when I was 17. 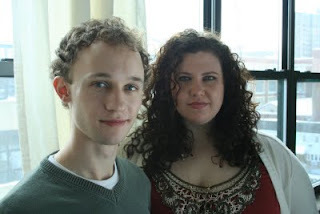 I had just come off of a month of intense theater training at Mason-Gross at Rutgers and wanted to write a story about kids my age in a truthful way. I just felt like there wasn't much out there that contained the language and means of communication that high school students actually used. The characters and story have changed dramatically since that first draft, which was a straight play, but that mission still presides. From what I understand, you've been working on this for a couple years. Take us through the development process. Mark Sanderlin: "Yet To Be Titled" existed for several years before I came on board. We met when I music directed a show Alex was directing and afterward, she approached me about turning her play into a musical. 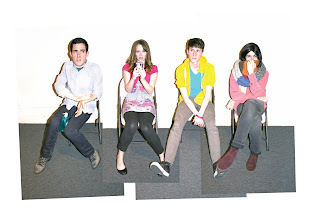 We developed five or six songs and put together a concert reading of the show, then called "Tangled", with large chunks of the script at Manhattan Theater Club in April 2010. It was performed there by four very talented actors doubling many of the roles - though we had every intention of writing in an ensemble. After that, we drafted a more complete version of the show with a whole slew of new characters and put together some table readings. In January of this year, we put up a staged reading at Theater for the New City with director McKenna Dabbs at the helm, for which we also went through the excruciating process of retitling the show because of Disney's new movie. We're now at The Tank in Midtown for a three-night engagement with a brand new 90-minute, no intermission format and back to a four person cast (down from up to 10 in previous versions!). How did you grow the collaboration? MS: Lots of caffeine. And then she throws things at me. AHR: I throw soft things. I always say Mark was more like my co-director. We were able to speak very freely and respectfully with each other almost instantly. When I asked him to write "At the Edge" with me, that relationship hit a lot of growth spurts. Honesty is the prevailing component that makes this partnership work. If we don't like something or are struggling, we tell each other. If we disagree, we talk (and sometimes fight) it out, but we always come to a conclusion that works best for the show. That's been our motto since day one: "Everything for the good of the show." MS: I always thought our motto was "Don't give me that look!"!? I've learned a lot about how to be a good artistic collaborator through this process, and I think that it's something that is grossly overlooked in most training that artists, writers, etc. receive. Learning how to handle compromise in situations where "compromise" is sometimes a dirty word is ultimately useful in every facet of life, in my opinion. AHR: I totally agree. And I'm not even sure that what we do is "compromise". I think we present our different sides and are able to hear each other well enough that we find the best way. Our greatest obstacle, I think, is closely related to that. Mark and I tend to get frustrated in the same way. When you have a partner that deals with frustration differently, you take turns being the cool head. When Mark and I get aggravated, we deal with each other in the same way, which just aggravates us more! Fortunately, we both diffuse frustration in the same way: by making jokes. Any advice for other new or young collaborators? MS: I still don't know that I want to do musical theater! I was an actor when I was younger and grew up around the theater so I guess it's in my blood whether I like it or not. In high school, my creative life took a different turn and I was focused almost entirely on songwriting and performing. That stayed the same into college until Alex dragged me kicking and screaming back into the theater, for which I will never forgive her. Songwriting and performing is still something I'm very involved in, but between "At The Edge," my involvement with the BMI Workshop and my unfortunate propensity for bursting into song, I'm not sure I will ever get rid of musical theater. Maybe they're working on a new kind of Valtrex for that. AHR: Musical theatre: yes. Writing: no. I also started as an actress, determined to be in a Broadway musical before I could drive! I started at Hofstra as an acting major, then switched to the Directing BFA program, then added a kind of unofficial Design minor. My first professional theater gig was actually as the costume designer for The Anthropologists. I had done some writing all through my theatrical meandering, but I really got serious about it in the past two years and it has been like a spiritual awakening. 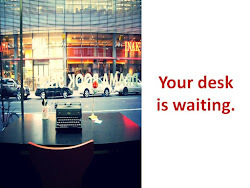 Looking back, I think I was just getting closer to writing each time I changed my focus. I love creating from nothing, building entire lives and worlds from a single thought, and adding music to those worlds is the closest thing I know to magic. How did you guys choose and work with your director? We told her about the project and she immediately said, "I will direct this." We were both too surprised to speak, but as she continued to tell us what was about to happen, we realized she was saying things that made complete sense and we just acquiesced. It was easier than arguing with her. AHR: Plus, I'm scared she might beat us up if we said "no." Our working relationship with McKenna (who has directed both our reading at Theater for the New City and our current staged reading) is very interesting. First off, we are all emerging artists with a lot to prove and we are hungry to prove it! Secondly, we are workshopping our show with her, meaning we make a lot of changes and have a lot of meetings and a lot of phone and text conversations and much too much coffee. From the get go, it was clear that McKenna understood the direction we wanted to go with the piece and having a director that understands your goals and intentions in addition to challenging your choices and helping to shape a show is invaluable. You have a staged reading coming up this week at The Tank. How did that come about and what are your goals with this presentation? AHR: McKenna actually brought this opportunity to us. After our reading at Theater for the New City, we had a very clear idea of the revisions we wanted to make and McKenna had directorial developments she wanted to implement. She hooked us up with The Tank through some connections and it was really just a matter of scheduling. Our goal for this reading is to break into the consciousness of the theater community and its patrons. We're at a point with the show where it is getting very tight and is ready for advanced development such as a legitimate workshop at a theater company. That would be our ideal next step. Where will you go from there? What's coming up next? MS: Into the great unknown! We've applied for a number of workshop programs and development opportunities and we're waiting to hear back from many of those before embarking on a definitive next step. 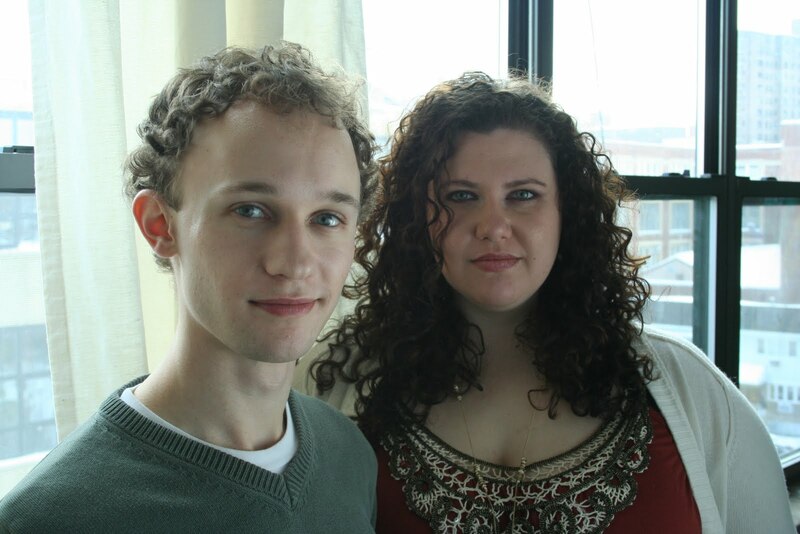 We're also really excited to get more of the LGBT community involved in the show. The subject matter of the show is so important, especially given recent events and we want to bring this story to as many people as possible. What are your writing schedules? AHR: Mark and I are not yet able to support ourselves on our writing alone. Shocking, I know! I mean, we've been at this for almost two years! Since we both work multiple jobs and have other projects and writing partners, the time we get to spend in the same room together is really important. When we're heavy in development or rewrites, we set a day or two a week that is devoted to our work together. This is usually when we iron out plot or specific problems with the show and work on songs, since we collaborate on lyrics. When I'm working on book and Mark is away working on music, I tend to write in great spurts. I'll work for five hours straight without getting up and then walk away from the work for a day or two, and come back to it to see how it reads after a little space. MS: Books. Music. New York City. Nutella. AHR: Neil Patrick Harris. That's all the inspiration I need. AHR & MS: Come to The Tank to see us! April 27-29, 2011 at 7:30pm each night! And also, world peace! 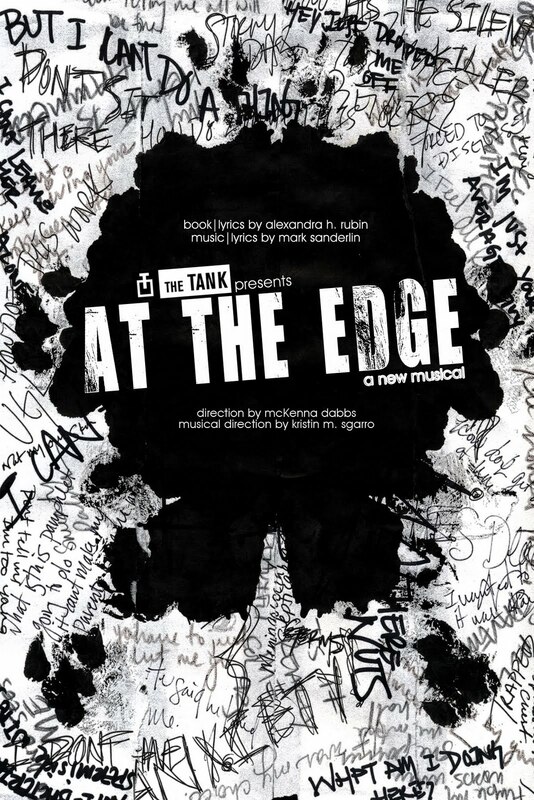 At The Edge is Wednesday through Friday, April 27-29, 2011 at 7:30 pm at The Tank (354 W. 45th St. btw 8th & 9th Ave.) Tickets are $12 online and $15 at the door. For more on At the Edge, visit www.edgemusical.wordpress.com.